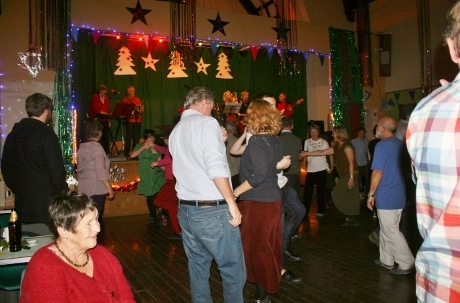 Two ceilidhs in the month to round off another good year for the band. Its always satisfying to get a repeat booking, and this time it was to Ambleside to play again for the Cumbria University Outdoor Education students. We expected lots of energy and enthusiasm and they responded with lots of both. Thanks to Sally and her team, and see you next year! Sally said afterwards - Thank you for another great night: same time next year! 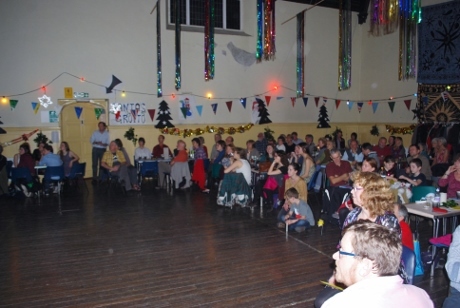 The final ceilidh of the year is usually the annual Crook Morris Christmas Ceilidh in the Kendal Parish Hall, and this year we were fortunate to have been invited back to play for the seventh year running, so we must be doing something right! As with previous years the band had a horn section, this year consisting of alto sax, alto trombone, and tenor trombone, and the overall sound was powerful and very danceable. 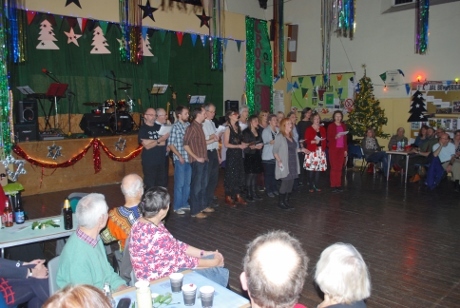 We like to show our singing skills at the start of the evening, and this year we started with the Halsway Carol, originally written as a schottische by Nigel Eaton, with words added later by Iain Frisk. 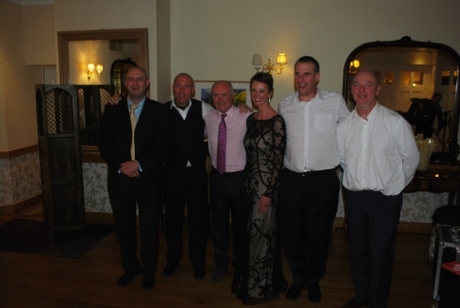 Another great evening which everyone thoroughly enjoyed. 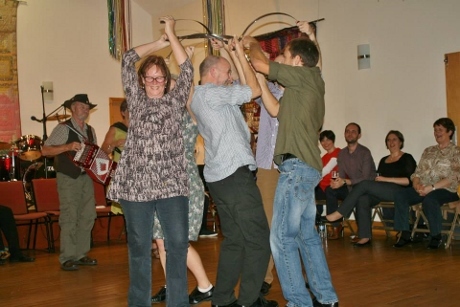 Crook Morris said afterwards - This year's Christmas ceilidh was a storming success, with the Tumbling Tom Super-band - three generations of Ords in the line-up - and great calling from Fiona and Les. Pauline's mulled wine was one of the best we have ever had - totally delicious. The dance displays were outstanding, with a world premier of Doris Lancer, our new dance written for elder-statesman-dancer Rique and a truly stunning rapper set, featuring the famous spinning, flying elves and a white clad celestial apparition. 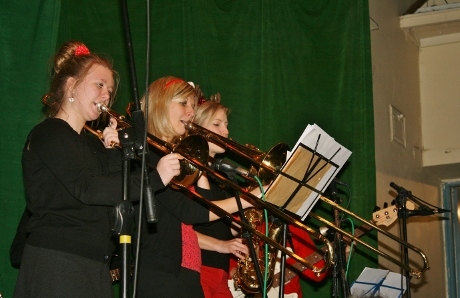 Two sets of seasonal songs from Kendal Revellers completed the evening's entertainment. All in all, a wonderful and memorable evening. 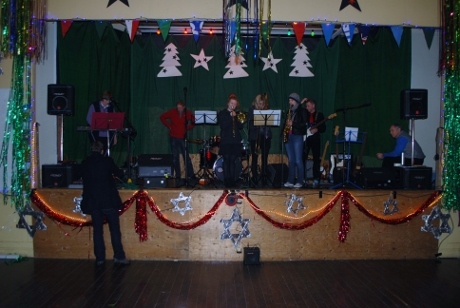 Thanks to all who helped to set it up and decorated the hall in such a magnificent way, served wine and mince pies, broke it down at the end and last but not least, to all who bought tickets and helped to make it such fun. Well played the horn section. Crook Morris demonstrating their rapper dance skills which included a double forward and backwards somersault. Another month and another wedding, this time for the marriage of Sarah and Jon-Paul, at a regular venue for the band - the Old England Hotel at Bowness. 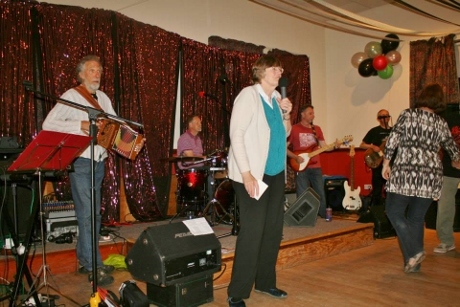 This was also a return booking as we played for the brides parents wedding anniversary some years ago. For the evening, we had Hilary depping on clarinet and saxaphone, for Fiona who couldn't make it. The Autumn season opened with a trip out to Simonstone Hall near Hawes for the wedding of Tim and his bride. 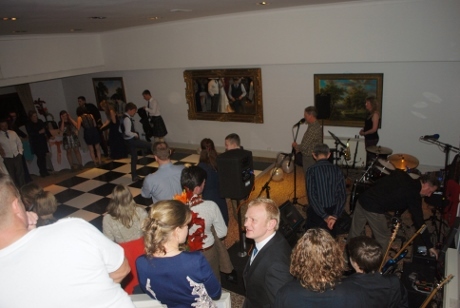 A new venue for the band, the hall proved an ideal location for the event, and all thoroughly enjoyed the occasion. Thanks to Tim and his wife for inviting us to share in their evening, and for making us very welcome. 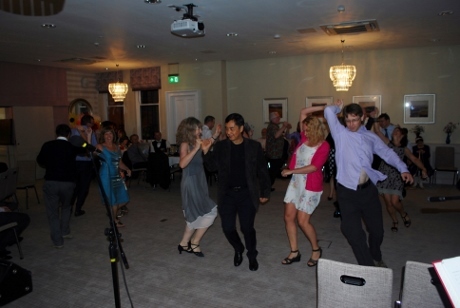 Tim emailed afterwards - Thank you so much for the fantastic evening you provided us with for our wedding. Everyone loved it! 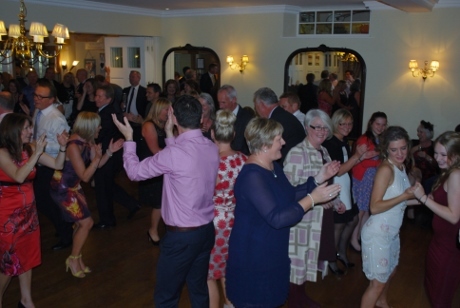 Below left shows the dancing well underway, and below right the bride and groom in the centre between friends. 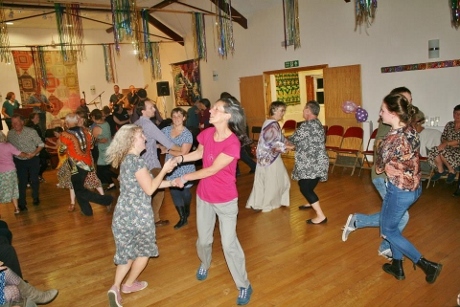 The next ceilidh was for the joint birthday party of two friends of the band, Rique and Anne, both of who dance with Crook Morris. Held in the lovely village hall at Barbon, the evening was a wonderful celebration and a great get together of relatives and friends. Happy birthday Rique and Anne! Rique and Anne said afterwards - A very very big thank you to all of Tumbling Tom for helping to make our party go with such a swing. Everything went without a hitch and your choice of dances suited the guests well. A particular thanks for including Rosa and also that special 80/60 dance you wrote for us. Anne and Rique dancing Rosa, one of their favourite dances. 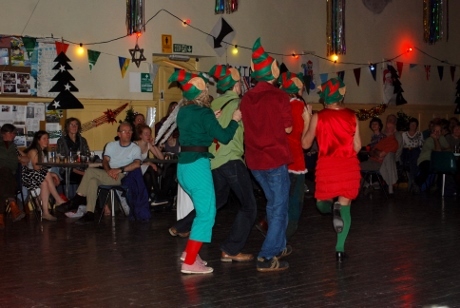 A great example of rapper dancing by Crook Morris. 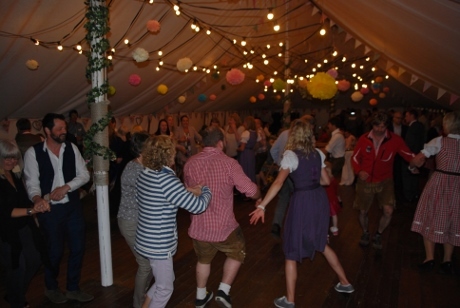 After a summer of music festivals, the ceilidh season got underway when we played for a wedding with an international flavour. Held at the recently refurbished Belsfield Hotel in Bowness, the bride Samantha was Malaysian-Chinese, and the groom Rob was British. 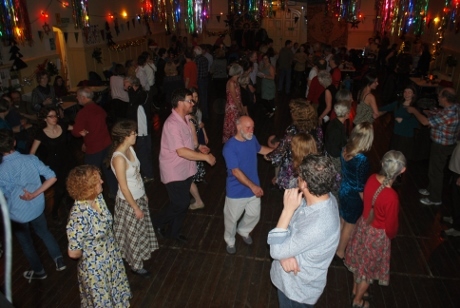 An enthusiastic group of dancers filled the floor the whole evening, and Sam's family went away knowing a little bit more about English culture. 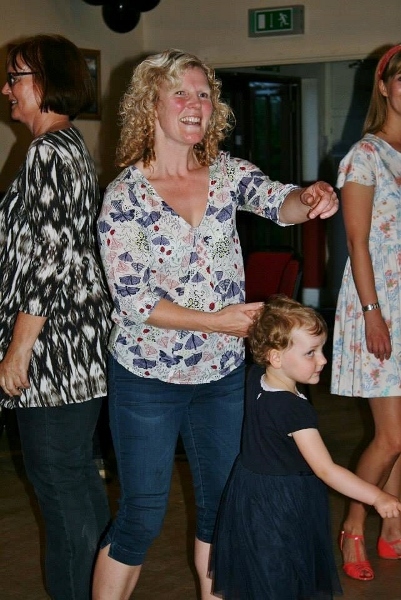 The first ceilidh of the month was a real family affair. 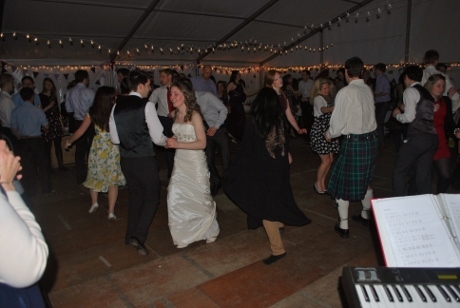 In 2007, we played for the wedding of Alex Burn at Whasset near Milnthorpe and had a great time in the marquee in their grounds. This time it was for the wedding of his sister Sophie to Paul in the same location in Whasset. A great night with a lovely warm atmosphere. Below left is the bride and groom, and below right a general scene during the evening. Thank you so very much for helping to make my birthday so memorable. The music was fantastic and the dances gauged perfectly! 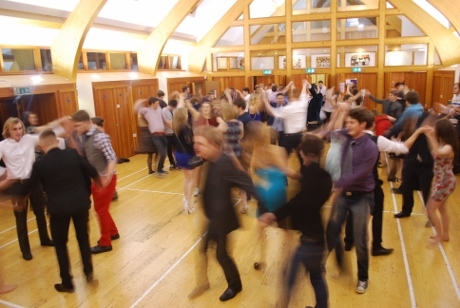 I believe we have a few ceilidh converts amongst my friends! We love playing at weddings and sharing a couples happy day. 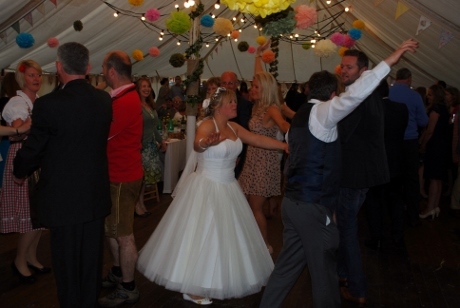 This wedding was at Shaw End Mansion, Patton Bridge, in a heated marquee for Lucy and Will, and what a great night it was with lots of enthusiastic young people. 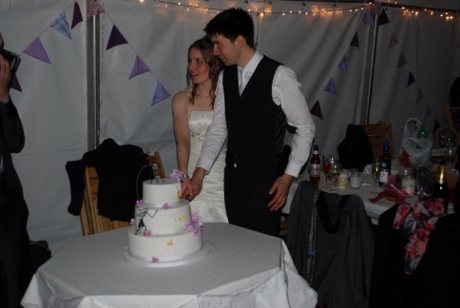 Below left are Lucy and Will cutting the cake, and below right sharing the dance floor with their friends. 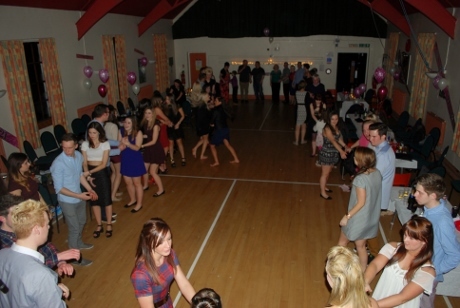 Hest Bank Memorial Hall is a venue we play at fairly regularly, and this occasion was for Kelly's 21st birthday: a lively evening with lots of young people enjoying themselves. 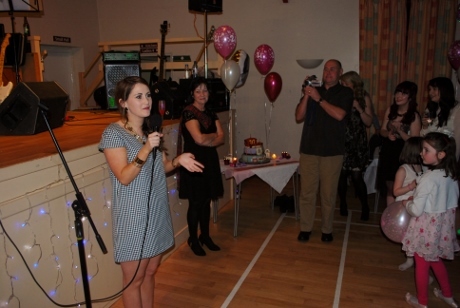 Below left is the hall during some of the dancing, and below right Kelly with her parents and the cake. Thanks to Meryl and her team for the evening.